As the presidential election nears, Morning Edition has begun a series of reports from First and Main. Several times in the next few months, we'll travel to a battleground state, then to a vital county in each state. In that county, we find a starting point for our visit — an iconic American corner — First and Main streets. 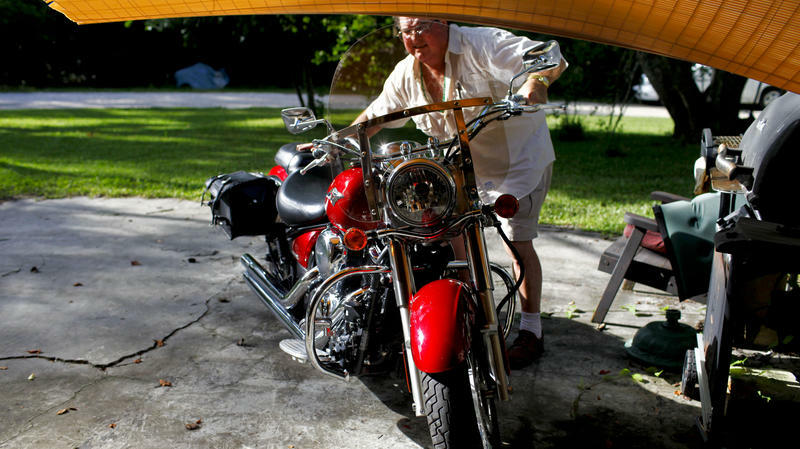 Near the corner of First and Main, in a trailer park in Hillsborough County, Fla., Gregory Brown sticks the key into the motorcycle he has for sale. Our primary election coverage continues with a look at the candidates vying to represent Southwest Florida in Tallahassee. We’ll hear an excerpt from the Florida Bar Association’s recent candidate forum in Fort Myers moderated by former Lt. Governor Jeff Kottkamp. President Obama cut short his two day campaign swing through Florida today in response to the mass shooting in Aurora, Colorado that left 12 people dead and injured dozens more. Instead of holding his previously scheduled campaign rally in Fort Myers this morning, the President took the opportunity to respond to the shooting. WGCU’s John Davis has more. Hundreds of people braved the heat and humidity in Southwest Florida Wednesday, standing in line for hours for free tickets to hear President Obama speak in Fort Myers on Friday.